Search engine marketing (SEM), internet online or digital marketing are forms of Internet marketing which involve using means such as paid advertising to promote websites by increasing their visibility in search engine results pages (SERPs). The principle is that the higher you rank in search results the more people will view your site and become customers. We are based in Taumarunui in the Ruapehu District and serve the local area such as Taumarunui Ohakune, Raetihi, Ongarue, Ohura, the whole of the Ruapehu area plus Te Kuiti, Ototorohanga etc. but also the whole of the North Island of New Zealand which is within easy reach of our office centrally located in Taumarunui. Search Engine Marketing covers the PPC (Pay Per Click) Advertising programme run by Google. 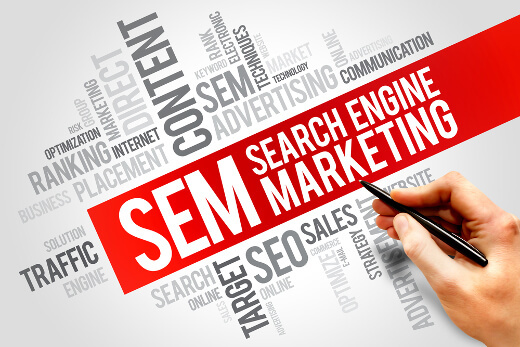 Search Engine Marketing (commonly known as SEM) focuses on the advertising aspects of Google’s search engine in the shape of advertsments running to display when keywords are typed in to Google. These advertisements generally rank higher and have more visibility than you can achieve by other means. The main feature of this programme is that the Adwords customer is only charged the advertising fee when the visitor clicks on their Advert so it is important to have a destination landing page that is relevant to the original keyword the user typed in and the Advertisement. We are fortunate to have a Search Engine Marketing Specialist on our team who will work hard to achieve the best results for you. Please contact us by phoning 07 895 3344 or by using the email contact form.